Nowadays, experts keep warning us that we need to be extra cautious when it comes to the food we consume and the products we use daily since they might contain dangerous components that can seriously affect our health. There are numerous highly processed foods on the markets, full of toxins, dyes, and additives, veggies, and fruits treated with pesticides, cosmetics with harmful chemicals, and so on, all of which are added to somehow improve the look or shelf life of items, to reduce costs or somehow trick customers. Such food processing is known as adulteration, which reduces the quality of foods and endangers our health. When it does not meet the nature of the substance or quality as per the demand of the consumer. Intentional adulteration: When the adulterants, like stones, sand, chalk powder, are added deliberately with the intention to increase profit. Incidental Adulteration: Adulterants, like pesticides, larvae of insects, droppings, end up in the food due to negligence, ignorance or lack of proper facilities. Metallic adulteration: When the metallic substances, like lead, mercury, arsenic, tins, are added intentionally or accidentally. Sugar is much cheaper than honey, so it is often added as a serviceable imposter of honey. Yet, to see if your honey has been adulterated, add a drop of it to a transparent glass of water, and if it disperses, it contains sugar. As a way to provide bulk and lower production costs, wheat flour is often adulterated with pebble straw, dust, weed seeds, and damaged grains. Bleach makes it clean and white. You should pour a bit on a clean sheet, and under close examination, you will distinguish grains and added impurities. Moreover, bleached flour has a bright hue and fine grain. Producers often add washing powder to ice cream to add a bright white sheen and lightness of flavor. Therefore, add a few drops of lemon juice on it, and if it starts bubbling, it has been adulterated. To obtain the traditional color of this spice, it has often been added dyes like metanil yellow, chalk powder, and lead chromate. Therefore, add a teaspoon of turmeric powder to a glass of water, and if it has been adulterated, it will leave a strong yellow color in water while settling to the bottom of the glass. Companies add clay to coffee to boost their fullness and save money. To check the quality of your product, ad half a teaspoon of coffee powder in a transparent glass of water, stir for a minute and leave it aside for 5 minutes. If it has been adulterated, clay particles will fall at the bottom of the glass. Often, detergents are added to milk as a way to boost the foaming and improve the whiteness and thickness. Yet, you should take 5-10ml of a sample with an equal amount of water, shake the mixture well, and if the milk has been adulterated, it will form a dense lather. As a way to meet the high demand, coconut oil is often combined with other oils. Therefore, you should pour a small amount in a transparent glass, place it in the refrigerator for 30 minutes, for it to solidify. If it has been adulterated, the other oils will remain as a separate layer. Metanil yellow is often added to rice to boost its appearance. To detect such adulteration, rub a few grains in the palm of two hands, and if you notice yellow dye on your hands, and the color of your rice disappears, it has been treated with metanil yellow. To make them brighter and more appealing to the eye, producers often add food dye to peas. Therefore, add several peas to a transparent glass, fill it with water, and mix well. After half an hour, of the water, turns green, it has been adulterated. 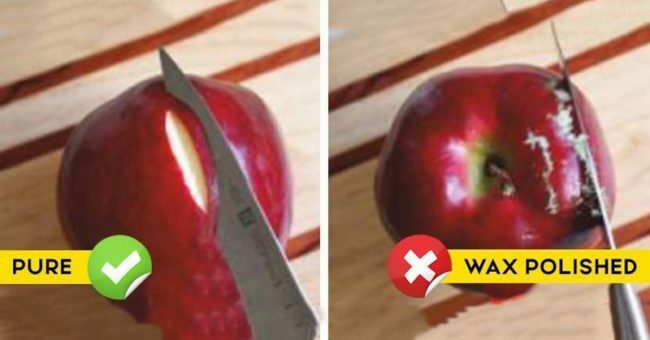 Scratch the surface of the apple with a blade, and if wax comes out, it has been wax polished. Make sure you stay informed and don’t be afraid to try these hacks and check the quality of the food you and your family consume, as it is just another way to ensure your health and wellbeing.